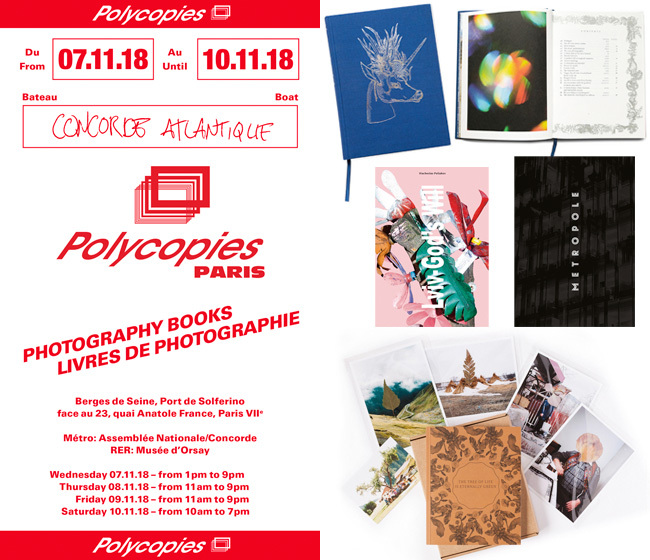 If you are in Paris this week please join us for the Polycopies photobook fair happening on the Concorde Atlantique boat, docked on the Seine just a short walk from the Louvre and Grand Palais (Paris Photo)! Hours are Weds-Fri until 9pm and Saturday 10am-7pm. We will have all our new and latest books with us – by Viacheslav Poliakov, Lewis Bush, Mandy Barker, Bego Antón, and Pascual + Vincent! Don’t miss out on the final copies available of The Disappearance of Joseph Plummer and The Tree of Life is Eternally Green! We also present a special ‘Tree of Life’ artist edition box from Pascual + Vincent, featuring their hand finishes to the trade edition book, flourished with clippings from their personal botanical collection gathered in Romania. Choose your box edition to include one of four prints, from an edition of 5 each. Meet Bego and pick up a copy of The Earth is Only a Little Dust Under Our Feet from the artist herself! This book promises to surprise and delight even the most cynical of viewers! Find us on the Seine at Quai Anatole France, Paris 75007 – See the MAP.